The gasoline puddle creates rainbows because the oil and water interface reflects. The thickness of the oil layer is less than the wave lengths of the different colours of light and reflects the different frequencies at different phases causing interference cancelling and also different angles of refraction. In this project, a silhouetted dancer performs an interpretative dance of eloquent movements, grand swooshes and cutting arm gestures. Live video captures and mirrors the viewer, embeds them below the interpretative dancer, just as in the gasoline puddle, the water floats the gasoline atop of it. Her energetic dance is slowed to a meditative study of gracefulness. Further video manipulations shift and fragment her silhouette, as the light is refracted between the gasoline and the water, stretching out time before the viewer, inviting reflection by the viewer as they see mirrored glimpses of themselves beneath the distortions. This project allows the viewers to become the subjects as well as co-creators, providing another path for viewers to re-contextualize environment and re-imagine themselves, like the rainbow transforms the gasoline puddle into something momentarily wonderful. Modesto sure has a lot to offer, from the annual X-Fest, the Tuolumne River, the Gallo Arts Center; and even more development is on its way! Take a sneak preview of Modesto’s newly discovered Adventure Land Safari. Col­lab­o­rat­ing with DOUBLE-VISION, Submerged is a video response to Modesto’s water uses and issues. This video poetically explores some key benefits the Tuolumne River brings to Modesto. Submerged. Produced by JGomula. Video footage played back at 400% – actual video is 4 times slower. Col­lab­o­rat­ing with the Modesto Art Museum, //Bii: Watch is cre­ating a four-part video response to Modesto’s rank­ing as the most unliv­able city in the coun­try. Through this video, we will explore some of the rea­sons for Modesto’s low rank­ing and re-imagine ways for the city to become a more liv­able place, or even a Utopian soci­ety. Our goal is to con­front the area’s poverty of imag­i­na­tion by using art — videos, archi­tec­ture, design, and game­play — to inspire cre­ativ­ity to help solve the area’s many urban problems. The four videos, each about 5 min­utes in length, are struc­tured around the city’s offi­cial slo­gan “Water, Wealth, Con­tent­ment, Health” and explore the city’s liv­abil­ity issues through its archi­tec­ture and urban design. While the videos doc­u­ment the city’s archi­tec­ture and design, they are pri­mar­ily expres­sive and exper­i­men­tal in their poetic inter­pre­ta­tions of each topic, and live video is incor­po­rated into the instal­la­tions. Accord­ing to the Amer­i­can Insti­tute of Archi­tects, archi­tec­ture and urban design offer a pow­er­ful per­spec­tive for explor­ing and find­ing reme­dies for a city’s liv­abil­ity issues. We have cho­sen this per­spec­tive to high­light the arts and their unique con­tri­bu­tion to explor­ing the area’s deep seated urban prob­lems. The per­spec­tive also focuses on art and artists as agents of change, and builders of the community. Water serves the entire project as a uni­fy­ing metaphor and visual image. It is a sym­bol for the area’s abun­dance and potential eco­nomic pros­per­ity. The Water video explores the spe­cific impor­tance of water in the econ­omy and envi­ron­ment of the Modesto area. The video includes the city’s bridges, canals, and water­ways, par­tic­u­larly the Tuolumne River run­ning through down­town Modesto, as well as a com­po­nent of live video. Water is also a way to re-imagine how Modesto can pro­tect envi­ron­men­tal resources and con­serve land­scapes, par­tic­u­larly along the Tuolumne River. The video explores how con­serv­ing land­scapes can lead to per­son­ally and com­mu­nally rewarding recre­ational and cul­tural opportunities. Collaborating Artists include: Julie Strong, Brittney Miller, and Alyssa Martinez. Water. Actual video footage, without live video component. Water. Final piece, requires webcam for live video capture and Flash Player. 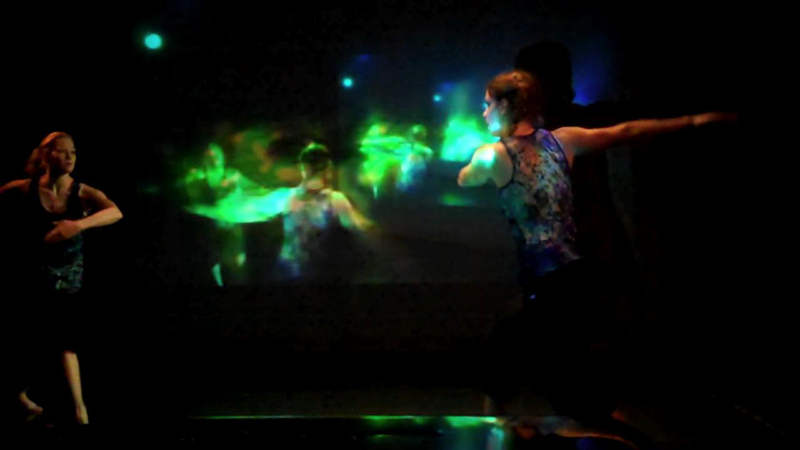 Performance of Water with live video. Dancers from Deep Root Dance Company. R.A.W. @ the Garage, San Francisco. The Wealth video exam­ines the eco­nomic well-being of the city through its res­i­den­tial archi­tec­ture and neigh­bor­hood design. The video explores issues of liv­abil­ity, par­tic­u­larly the city’s high rates of home fore­clo­sure. The video explores ways to re-imagine Modesto neigh­bor­hoods, overlaying hopes and desires of individual Utopias on areas of blight and decay; allowing Modesto to rise as a Phoenix and return to its notoriety of the mid twentieth century. Vari­ety cre­ates vibrant, pedestrian-friendly, and diverse com­mu­ni­ties and accom­mo­dates res­i­dents in dif­fer­ent stages of their lives. Collaborating Artists include: Julie Strong, Brittney Miller, Alyssa Martinez. The Contentment video exam­ines the perception of citizen’s of the city through their participation in the annual LOVE Modesto volunteer day. On April 2, 2010 over 5,000 people contributed to this city-wide church sponsored event. The documentary video explores practical issues of liv­abil­ity, specifically the Habitat for Humanity projects within the Modesto. 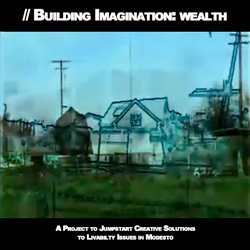 The video documents concrete ways to re-imagine Modesto neigh­bor­hoods, overlaying hopes and desires of individual Utopias on areas of blight and decay.